I have custom button which opens a dialog box of out of the box page Upload.aspx of a document library. First I am getting the GUID of the library by REST API and then passing the URL to open it into the dialog. The code works properly. it allow user to upload a file and it is saved to actual document library. 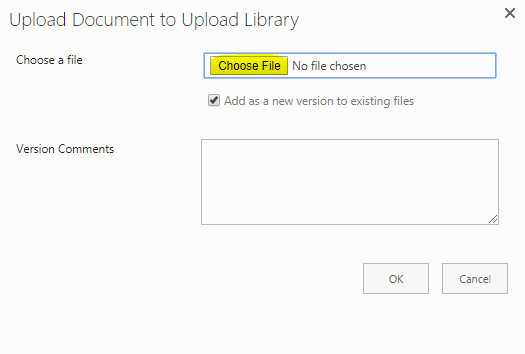 But my problem is when I try to select multiple file, it doesn't allow me, where the actual out of the page when I click upload from the document library it allows the multiple file upload. I have verified both the pages have the same URL. I have tried doing it with static GUID but still no luck. What am I missing here? Anyone have encountered such issue before? When I open the same page with custom code, it shows below screen, button text for upload is Choose File. Not the answer you're looking for? Browse other questions tagged file-upload library modal-dialog online or ask your own question.